For its latest iPhone diversion, developer Ngmoco aims to give iPhone and iPod touch owners all the joys of having their very own pet with almost none of the housebreaking. The newly announced Touch Pets Dogs promises to combine the connectivity of a social network with the fun of playing with puppies- creating a pet simulator game for a new generation. 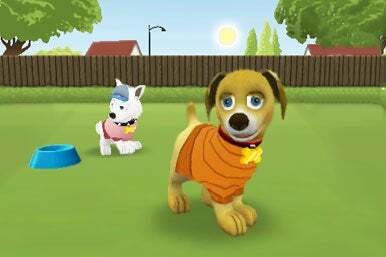 In Touch Pets Dogs, players will be able to adopt, pet, train, dress, and play with a 3-D puppy dog of their choosing. During a demonstration of the game at Ngmoco’s San Francisco office, I got to see the five breeds initially available to the player. I threw a ball around the room, took the puppy outside his home to the backyard, and watched as the l’il critter realistically responded to affection and in-game objects like Frisbees and brushes. Players will also be able to customize the appearance of their puppy by buying gear with an in-game currency called “Puppy Bucks.” An easy-to-use dropdown menu allows you to navigate through the many grooming, toy, and clothing options. I dressed my puppy with a spike collar and green sweater in seconds. While these interactions will surely please casual gamers, more dedicated players can enjoy a deep and rich experience as well. If you get a ball for your puppy, simply throwing it around the room will look different every time you throw it thanks to a sophisticated physics engine. You can train the dog to grab the ball, jump on command, and do many other tricks. You can then guide and train your puppy to unlock achievements, accomplish missions, and even pursue careers. You can share your puppy’s accomplishments with mission postcards and train your dog in one of five career tracks- like crime-fighting or fashion. 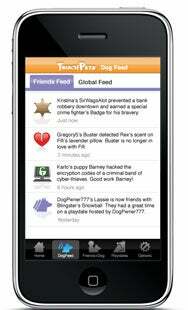 Touch Pets Dogs gives you a feed for the activities of your friends’ puppies as well as a global feed. The most interesting aspect of Touch Pets is the app’s built-in social connectivity. You can create an account and show stats on your puppy and see your friends and their puppies in the global feed. The global feed will tell you many important things about a puppy beyond simply listing accomplishments and stats. For example, if you see in the global feed that your friend’s dachshund is hungry, you can hop over to his house and feed it. Setting up a playdate between your dog and another only takes a couple taps, and since you always have access to your dog, the playdates are asynchronous. A puppy’s social life will continue even when their owner is not logged into the game and his/her interactions with other puppies will be broadcast in the dogs’ feed. Dogs will develop relationships with other dogs and will grow attached to one another or may even squabble at times (but not fight). Fans of pet simulation games will immediately recognize the familiar 3-D art style and clever AI that were hallmarks of the original Petz titles, which launched in the mid-’90s and were widely considered the first (and best) simulation games of their genre. Andrew Stern of Stumptown Game Machine developed the classic AI for the Petz series and lends his considerable experience and talents to Ngmoco’s Touch Pets. With an experienced development team behind the project and a smart marriage of social connectivity and interactive gameplay, Touch Pets Dogs looks to be a clever adaptation of the pet simulator genre to a new platform. Look for this title in to hit the App Store later this spring.